First up for installation is the Nintendo DS Lite. I've had this unit since it was released and the white is getting just a little boring lately. 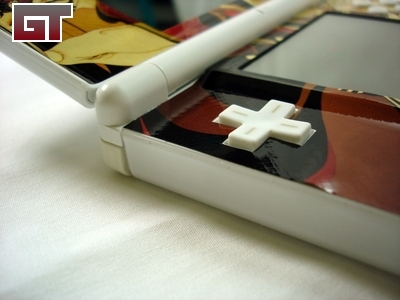 The first thing you'd want to do is clean up the DS with a soft cloth. This will remove some surface grime that may have accumulated. You can even go as far as wiping it down with some alcohol -- this all depends on the condition of your unit. 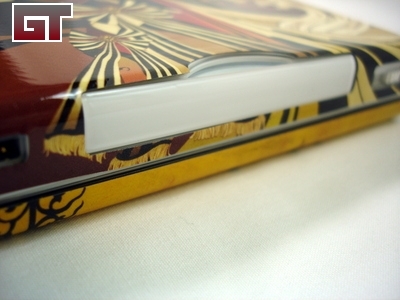 The thickness of the GelaSkin gives it a 'cushion' type of feel. The skin definitely feels strong enough to withstand a few bumps and scratches. Upon peeling away the first part of the GelaSkin, I noticed that the speaker holes were punched, but due to the size of the holes the remaining pieces came up along with the skin. I used a straightened paper clip to poke the little pieces out. For the top portion, I used the speaker holes to act as a guide as to where to place the skin. 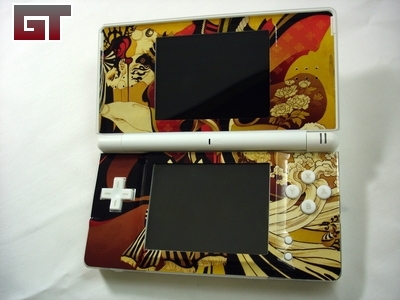 On the bottom, I used the control pad and buttons to position everything. I was impressed with the clean cut and finish after applying the skin. 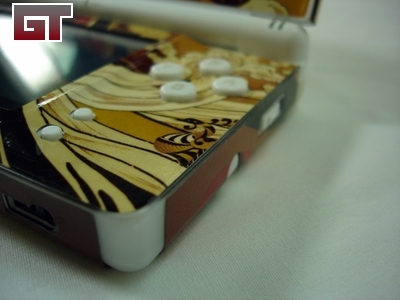 The skin sat flush all the way to the edge of the DS with all the buttons lined up correctly. With the first try, I had to lift up the skin again to shift it up a bit. 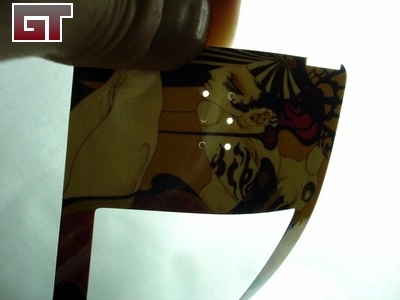 The skin came away without much force and the adhesive was still sticky ready for re-application. The outside skin covers nicely all the way to the edges as well. 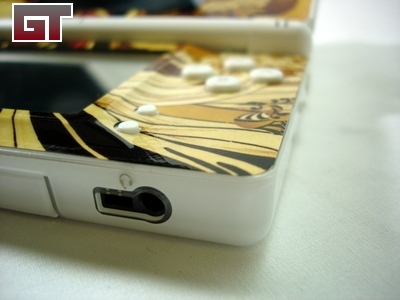 The power, stylus, and GBA port are all exposed so you can access them. 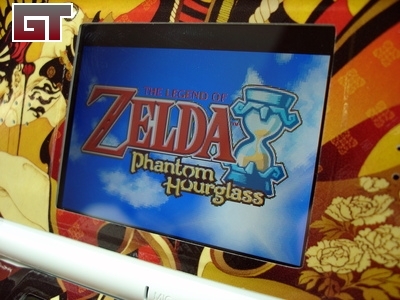 From testing, I think the GBA cut out should be just slightly bigger. I notice slight rubbing when inserting and removing a cart. Even with re-adjusting the skin, it's just slightly too tight in that area in my opinion. 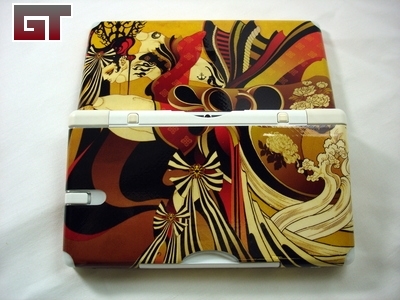 Now here's the only drawback for this skin -- the battery panel is covered entirely. So if you ever have to replace that battery, you will need to remove the skin to get access to it. 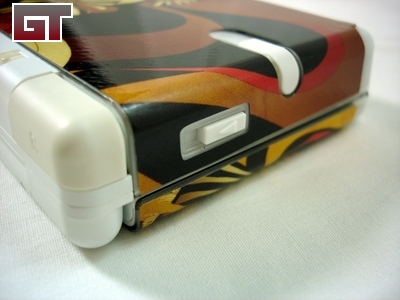 Maybe GelaSkins will provide a skin with the battery panel area cut out in the future. With all the four skin pieces on, the DS looks entirely different. 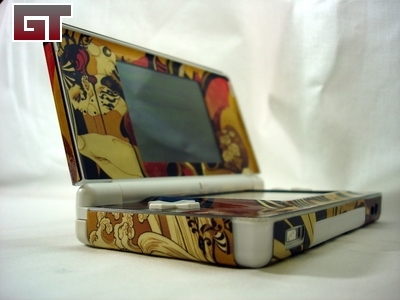 Due to the curved edges on the DS, the GelaSkin does not wrap around it so that small section and the hinges are exposed.